A potent add-on to Shareaza P2P application. Most modern technology used augment download speed and enlarges the amount of download sources. 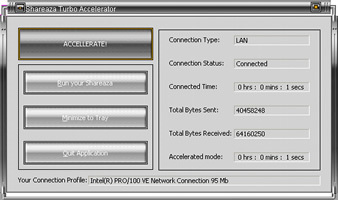 Shareaza Turbo Accelerator is a potent add-on to Shareaza P2P application. Most modern technology used augment download speed and enlarges the amount of download sources. The interface is eye-catching and user-friendly. The application is totally FREE and there are NO Ads, NO Adware, NO Spyware, NO Trojans bundled! Finished and wrong files are cleaned automatically. Digiters Sound Recorder- With the recorder you can directly digitize recordings of music cassette tapes, streaming Internet audio, vinyl LPs, videos, ect.